Although Apple and Samsung regularly drag one another through the slog of the courtroom in quibbles over patents and whatnot, these two keenest of rivals also like to take digs at each other through advertising. Whether a new product is being released or has been around for several months, both Apple and Samsung like to point out the flaws of their adversary’s product lines, and now, the Korean Galaxy maker has taken a pop at the iPhone’s battery life. Samsung has, in the past, used the iPhone launch as a prime target for some Apple-focused ribbing, and although we’re still a good couple of months away from seeing what’s next out of Cupertino, Samsung has nonetheless seized the opportunity to poke a little fun at the iPhone and its users. 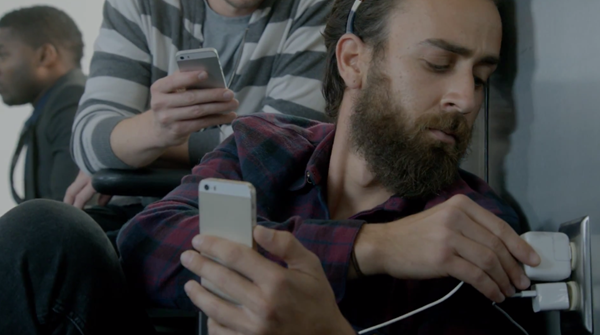 The new advertisement, which looks to promote the relatively-new Galaxy S5, sees iPhone users scrambling for power outlets at an airport, with their batteries running near-empty. Galaxy S5 owners, meanwhile, have the benefit of the in-built ultra power saving mode, as well as the option of popping in an extra battery pack. Even though the next-gen iPhone is set to grow, in line with Android devices like the Galaxy S5, you can rest assured that removable battery will not be on the agenda, and although Apple always endeavors to improve device efficiency and ensure that its comparatively low-capacity batteries retain enough juice to power through a whole day, you do feel as though situations like this one highlighted by Samsung will remain commonplace. These ads are only ever funny if there’s any truth behind the banter, and while the iPhone 5s, like its predecessors, remains strong in many departments, it still doesn’t cover itself in glory from a battery retention point of view. The Galaxy S5, meanwhile, in our tests, handles itself rather well. Not only that, but with the benefit of the power saving options and, of course, the removable battery, you can always make provisions and ensure that your handset keeps ticking over. Below, you can check out the new Galaxy S5 ad in its entirety. Be sure to give it a watch, have a little chuckle or two, and as ever, do share with us your thoughts and opinions in the comments section. Samsung does a wonderful job of skewering Apple in their advertisements. I hope when Apple finally ships the iPhone 6, you see a new collection of people sitting outside an Apple Store.